Have you ever had to sell a project after having screwed it up royally? That’s the case with today’s Nice Price or Crack Pipe Kawasaki, but maybe the seller’s loss can be your gain. Yesterday’s sweet custom 1982 Datsun 280ZX droptop ended up with a 65-percent Crack Pipe loss for its $14,000 asking price. That broke the chain of Nice price wins we had going, all the way back to last Friday. And now I have Break the Chain by Fleetwood Mac ear worming its way through my head. Thanks for that, you guys. Hey, you know what we haven’t had here in a while? That’s right a cop bike! I think it’s a concept whose time has come. 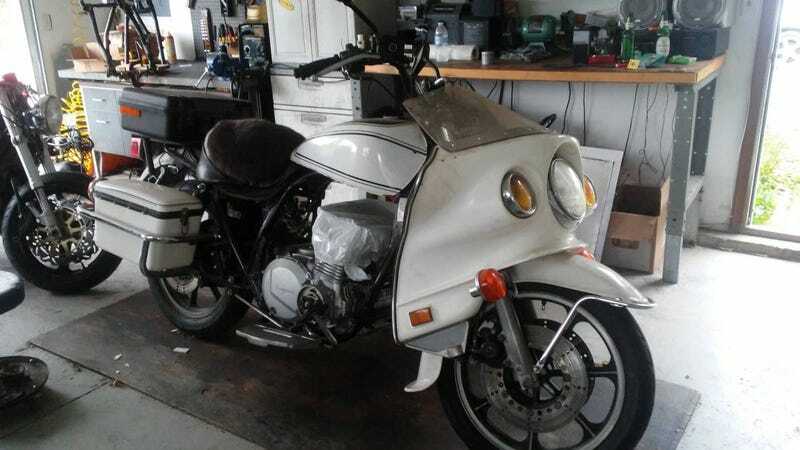 Take a gander at this 1982 Kawasaki KZ1000P. That’s P as in Police. Or Po-Po if you are so inclined. The KZP was Kawasaki’s ultimate cop bike, but it wasn’t their first. That honor would go to its predecessor, the KZ1000C which Kawasaki launched in 1975 as their factory competitor in the law enforcement market. Prior to the KZC the company had offered bikes with dealer-installed options making them suitable for such service, but the C and successor KZP were built as cop bikes from the get go. The changes from the consumer bike included the addition of the iconic fairing/windshield, painted fenders, a spring-suspended tractor saddle seat, panniers and fender-top radio box, folding floorboards in place of foot pegs, bead-locking wheels, and wiring for pursuit lights and siren. Phew! Power is provided by a 998-cc air-cooled DOHC inline four and that’s good for a solid 88 horses. A five speed—one down, four up—gearbox puts those ponies to work. Well, today you can make that sweet bike be your bike. There’s just a couple of catches here. The ad for this ’82 KZP notes that it is the seller’s dream bike. He says that it offers a “[c]ombination of muscle and comfort.” He also says that he’s selling it because he screwed up. The ad claims that while reassembling the engine he installed the camshafts incorrectly and then bent the valves upon turning it over. I’m not sure how you could do that—I just don’t know the intricacies of the KZ motor—but needless to say, this bike needs some headwork. Now, we all could use some of that I’m sure. I know I’m a little milky in the melon. The question here is, how much would it entail to get this cool cop bike road worthy once again? A quick scan of the eBays shows used heads for the KZ1000 going for anywhere between a couple hundred bucks up to over a grand. Yeah, screw those latter guys. I’m guessing that singing up to a KZ forum and then trolling the classifieds would be the best way to find a new head, or help with sourcing parts and service to bring the current one back to working condition. The rest of the bike looks to be well worth the effort. You’ll note that most of the pics in the ad show the bike fully assembled. For full transparency, I chose to lead off with the most representative one, where it’s been pulled apart. It’s only fair. The other apparent issue here is the tires that are moldy oldies, and in need of replacement. Also, it should be noted that most of the cop stuff—flashy lights, siren, Motorola—have all been removed, as you can’t have that. Wow, it just keeps getting better, right? Well, to perhaps make up for the bad head and rotten tires, the price here is only $900. That’s chump change and in my mind a lot of bike for the buck. Of course, we’ve already stablished that my mind isn’t exactly role model worthy so you’ll now need to weigh in on weather this broken bike is worth even that kind of modest cash. What do you think, is this project police bike worth that $900 asking? Or, for that much is this a ride that couldn’t even get arrested in this town?